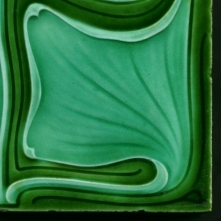 The rim is somewhat uneven in manufacture, amongst the unevenness is a very tiny chip, a few losses and a touch of roughness, light marks to the glaze barely impact the brilliance of the tile. A superb and famous design that fills the tile perfectly, a design we would love to see more of and this and this in a super colourway. A nicely well painted example, with no outline to contain the glaze colours when seen this design can be excessively smudgy, this is an extraordinarily great example of this iconic design. 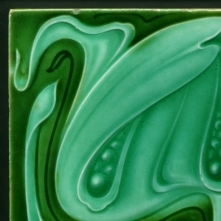 The lighter green glaze is extraordinary, of the standard of glazes by Sherwin & Cotton. 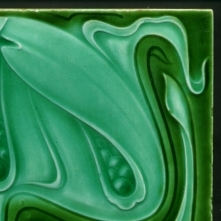 We may marvel at the modelling work of George Cartlidge's 'photographic' tiles yet what escapes most people is that it is the glazes that make those tiles so great, without the glazes the modelling work would appear no better than any of the competing companies. 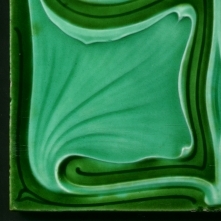 Compare this with a fabulous blue example of the same design and appreciate what the effect of a really top quality translucent yet intensely coloured glaze is. Verso very slightly grubby, embossed A. M. Ltd., England and design registration number, handwritten pattern number.